I am recently testing an assertion that I have concluded namely that atheism is a faith based position just like theism is a faith based position. The reason I arrived at this conclusion is that theists have no proof that God actually exists. It's purely a matter of faith. Yes, there maybe strong implicit proof that God exists in their opinion (scriptures, history, etc) but there is no concrete proof of God's existence. In my view, atheists also suffer from the same problem of providing a proof of their position. Specifically that they cannot prove that God is non-existent. The typical rebuttal I get is that the burden of proof is on the theists. But I view this as a cop out and they hide behind the wall of burden of proof which is just a bias in the debate. Given the above, I claim that both atheism and theism are positions based on faith. Would it be incorrect to claim that? We must draw a distinction between atheism and agnosticism. Atheism is not believing in the existence of a God (or Gods), regardless of whether conclusive evidence is available, while agnosticism is the view that conclusive evidence for whether a God or Gods exists cannot exist1. There can be an agnostic atheist, a gnostic atheist, an agnostic theist, or a gnostic theist. You seem to be claiming that because we cannot have conclusive proof that God does not exist, therefore atheists are operating out of a purely faith-based position. Here's the thing: most atheists are agnostic. They accept that we can never know for sure that God does not exist, but they think it is more likely for the default state (no God) to be true in the light of insufficient evidence by theists2. There is nothing wrong with this. For more about the distinction between atheism and agnosticism, see The Difference Between Atheists and Agnostics by ThoughtCo and the entry on Atheism and Agnsoticism in the Stanford Encyclopedia of Philosophy. 2While agnostic atheists do not have beliefs based on blind faith, it is also true that the majority of gnostic atheists do not have beliefs based on blind faith either. (This is not true for all gnostic atheists, however.) This is because gnostic atheists might have logical arguments which completely, in their view, debunk the very concept of a God (or Gods). An example might be someone who thinks that the concept of omnipotence is self-contradictory. No, atheism is not a faith based position. This has been debunked time and time again and there are numerous resources on the internet that cover this error in logic. If theism claims the existance of a god, an atheist is one who is not convinced of that claim and rejects it. An atheist has no responsibility to disprove the claim that god does exist because the atheist is not asserting anything. The burden of proof is on the person trying convince another with their claim. Claims require support and the thiest made the claim so the thiest must support it. Not having faith in something is not faith much like not having a hobby is not a hobby and not exercising is not a form of exercise. The only requirement of meeting the definition of "atheist" is that you do not have belief in any god(s). Computers, rocks, and newborn babies are all, by definition, atheists; because they do not believe in any god(s), notwithstanding that they do not understand what is meant by "god", nor that they have never even thought about the question, nor that they do not even have the cognitive capacity to consider the question. No faith is required to not subscribe to a faith-based belief, because having faith is not a default attribute of anything, human or otherwise. It is simply not part of the definition of being an atheist that you must have some kind of belief one way or the other on whether there is one or more god(s). Now it is not clear that naturalism, as it stands, is a religion; there is enough vagueness around the edges of the concept of religion for it to be unclear whether naturalism does or doesn't belong there. But naturalism does serve one of the main functions of a religion: it offers a master narrative, it answers deep and important human questions. Immanuel Kant identified three great human questions: Is there such a person as God? Do we human beings have significant freedom? And can we human beings expect life after death? Naturalism gives answers to these questions: there is no God, there is no immortality, and the case for genuine freedom is at best dicey. Naturalism tells us what reality is ultimately like, where we fit into the universe, how we are related to other creatures, and how it happens that we came to be. Naturalism is therefore in competition with the great theistic religions: even if it is not itself a religion, it plays one of the main roles of a religion. If being faith-based means to believe in a master narrative that answers Kant's questions, that atheism might be considered, using Plantinga's argument, a quasi-faith-based or a quasi-religion. However, not all atheists need be labeled as believing in naturalism or any other master narrative. There also may be good reasons not to link atheism in general, or even the atheism of naturalism, too closely with religion. In Where the Conflict Really Lies Plantinga wants to show that traditional theistic religions have at most a superficial conflict with science while naturalism has a deep conflict with science through his Evolutionary Argument Against Naturalism. He would likely want naturalism to stand apart from traditional religions when making such a critique of it and not consider it as a religion. If the atheism being considered presents a master narrative in competition with theistic religions it could be considered a quasi-religion because of that narrative. Not all atheists have such a narrative nor believe in naturalism. Some atheists may be simply indifferent to such narratives. Plantinga, A. (2011). Where the conflict really lies: Science, religion, and naturalism. OUP USA. Both positions, the theist and the atheist made a claim: The theist claimed the existence of god, the atheist claimed the non-existence of god. History shows: Neither of them could prove his claim. Having learned the lesson, today’s atheists make a weaker claim: The traditional god-concept - god being omnipotent, omniscient, all-good - is inconsistent. The concept leads to the problem of theodicy. Hence atheists consider the existence of god a hypothesis. They claim that this hypothesis creates more problems than solves existing problems. Therefore atheists dismiss this hypothesis. They know: A world-model without a god-concept is less complicated but leaves open fundamental questions due to lack of reliable answers. IMO that’s not faith but heuristics. There are gnostic and agnostic atheists. The Burden of proof would only lie on gnostic atheists specifically to prove that a god does not exist. This was addressed in a previous answer in this thread by the user YiFan. However, some atheists may hold a gnostic standpoint on the existence of some gods, for example, those who are characterized as omnipotent and omniscient because these characteristics would be logically paradoxical or contradictory in some way. See God paradoxes on wikipedia and Gods’ Contradictory Characteristics. Is Atheism Based on Faith? Atheism is not faith-based because it does not make claims to have faith in. For example, someone, such as a young infant, who has never heard of the notion of a god is an atheist that hasn’t placed faith in anything regarding the existence of a god or gods. Atheism is a default position. Atheism and Naturalism are independent of one another however many people who are atheistic are also naturalists. Methodological naturalism makes no claims about whether god(s) exist. Philosophical metaphysical naturalism on the other hand does make claims regarding the existence of god(s). A person can have faith (a great trust and/or confidence) in the methods and/or ideologies of naturalism. Hypothesize a God who plays an important role in the universe. Assume that God has specific attributes that should provide objective evidence for his existence. Look for such evidence with an open mind. If such evidence is found, conclude that God may exist. If such objective evidence is not found, conclude beyond a reasonable doubt that a God with these properties does not exist. This is basically how science would disprove the existence of any alleged entity. If God existed, there should be concrete evidence of His existence—not [blind] faith [in the religious sense], but tangible, measurable, consistent evidence that can be predicted and tested using the scientific method. If we fail to find that evidence, then God cannot exist as defined. In order to prove impact on the universe, there must be measurable and testable events that could best or only be explained by whatever this "God" is we are hypothesizing. Believers must be able to present a model of the universe in which some god is "either required, productive, or useful." This is obviously not the case. Many believers work hard trying to find a way to introduce their god into scientific explanations, but none have succeeded. No believer has been able to demonstrate, or even strongly suggest, that there are any events in the universe that require a supernatural being to explain. The first religious sense of faith is a type of belief, specifically belief without clear evidence or knowledge. Christians using the term to describe their beliefs should be using it in the same way as Paul: "Now faith is the substance of things hoped for, the evidence of things not seen." [Hebrews 11:1] This is the sort of faith Christians often rely upon when confronted with evidence or arguments that would disprove their religious beliefs. This sort of faith is problematic because if a person really does believe something without evidence, even weak evidence, then they have formed a belief about the state of the world independent of information about the world. Beliefs are supposed to be mental representations about the way the world is but this means beliefs should be dependent upon what we learn about the world; beliefs shouldn't be independent of what we learn about the world. If a person believes something is true in this sense of "faith," their belief has become separated from facts and reality. Just as evidence plays no role in producing the belief, evidence, reason, and logic can't disprove the belief. A belief that is not dependent on reality also can't be refuted by reality. Perhaps this is part of how it helps people endure the seemingly unendurable in the context of tragedy or suffering. It's also arguably why it's so easy for faith to become a motivation for committing unspeakable crimes. The second religious sense of faith is the act of placing trust in someone. It may involve no more than having faith in the words and teachings of religious leaders or it may be faith that God will fulfill promises described in scripture. This sort of faith is arguably more important than the first, but it's one which both theists and atheists tend to ignore in favor of the first. This is a problem because so much of what believers say about faith only makes sense in the context of this sense. For one thing, faith is treated as a moral duty, but it's incoherent to treat any belief as a "moral duty." In contrast, having faith in a person who deserves it is a legitimate moral duty while denying faith to someone is an insult. Having faith in a person is a statement of confidence and trust while refusing to have faith is a statement of distrust. Faith is thus the most important Christian virtue not because believing that God exists is so important, but rather because trusting God is so important. It's not mere belief in the existence of God which takes a person to heaven, but trust in God (and Jesus). There are different ways you can attribute faith as illustrated in the above citation, but I think what matters in the context of this question is whether not a person can be without faith in the presence of their belief. Under the most lenient definition faith which is: a "great trust or confidence in something or someone" and the most lenient definition of belief which is: "a state or habit of mind in which trust or confidence is placed in some person or thing" our definition of theism would read: Theism is broadly defined as the state or habit of mind in which trust or confidence is placed in the existence of a Supreme Being or deities. Because faith can be defined as "great trust or confidence in something or someone" a theist can indeed be without faith. These theists would be considered agnostic theists. A theist with great trust or confidence that there is a god can also be agnostic so long as they don't believe to know with 100% certainty that a god exists. "People say that some supernatural being exists, and they call this 'God.' Until they provide sufficient evidence for this claim, I choose not to accept the claim." This position is often called weak atheism (contrasted with strong atheism), negative atheism (contrasted with positive atheism), or agnostic atheism (contrasted with gnostic atheism). Weak/negative/agnostic atheism rejects the claim that a god exists because the claim is not sufficiently substantiated. Whereas strong/positive/gnostic atheism asserts the positive claim that god either does not exist or is unlikely to exist. In the case of weak atheism, the burden of proof truly is on the theist, and the atheist does not hold a faith-based position. This is not a "cop out" or "bias," it's just logical that this would have to be the case. Most people accept this logic for other extraordinary claims. They typically don't believe in other gods such as Zeus or Thor, and to not accept these polytheistic claims isn't generally considered faith. If I said that I had a gigantic firebreathing dragon in my basement, you wouldn't believe it unless I provided good evidence for it. Of course, if I simply said "I have a dog at home," you most likely would believe me. But that's because you have massive amounts of prior experience and evidence of people owning dogs that it seems totally reasonable and justified for you to believe me. If I said I owned a rocket-launcher at home, you might or might not believe me. This claim is a bit more "out there." It's certainly less common than owning a dog. You might be quite skeptical, but if I argued well I could possibly convince you that I had a rocketlauncher. I could also show you it, and you would be immediately convinced. Also, if you accepted any claim without sufficient evidence, you would necessarily come to accept contradictory claims. People claim things all the time, and sometimes those claims come into conflict. You say that "My assertion is that neither position can provide conclusive proof. Therefore both are on faith." However, this puts you in a (very unreasonable, in my opinion) position that everything is faith. This is not how science or epistemology works. In science, nothing is ever conclusively proven, it is rather somewhere on the spectrum of weakly substantiated by evidence to extremely well-substantiated by evidence. Scientific models are not "true", but are rather models that approximately explain some underlying reality. Newton's laws are not "true", but they are a very good approximation of reality. That I claim this is a good approximation is neither based on "faith" or "conclusively proven," but is rather a claim that is extremely well-substantiated by evidence. In fact, some models are even better than Newton's laws--the model championed by Einstein. The (weak) atheist position is not that the god claim hasn't been "conclusively proven," but rather that it hasn't been sufficiently substantiated to justify accepting it. Therefore, they remain skeptical of this claim. They don't accept the claim until it is sufficiently substantiated by evidence. While the position held above can describe the word 'atheism,' in reality atheists are people. People who hold multiple beliefs, have behaviors, lifestyles, attitudes, and so on. There will also be trends among these. For example, while it isn't logically necessary to be an atheist, in reality atheists might be statistically more likely to believe in an earth older than 20,000 years old. They also might be more likely to be more socially liberal, which you may or may not find reasonable. Atheists in the United States are more likely to think that abortion is acceptable. You may or may not find this position reasonable. Perhaps you think they justify murdering helpless babies. Atheists are also more likely to view religion as a bad thing, just as another example. Logically, there is nothing stopping religion from being a net social positive, even if god didn't exist. If they claim that religion is a bad thing, then this is an affirmative position and should be argued on its merits. Some atheists might argue more strongly that religion is a net negative (see e.g Richard Dawkins, Christopher Hitchens or Matt Dillahunty), whereas other atheists are more keen to argue that religion also has substantial social benefits (see e.g Jonathan Haidt or David Sloan Wilson). I'm an atheist, but there are many beliefs that are more (statistically) commonly held by atheists (than, say, Christians in the United States) that I find (1) morally indefensible, and (2) scientifically and logically unreasonable. Yet I still hold the weak atheist position as described in the former sections, even though I might find a certain subsection of atheists as people to be generally unreasonable in other respects. Of course, there are also things that are more common among theists that I find unreasonable. Answers so far have considered evidence, proof and strength of argument. There's another point to consider though - utility. What is the purpose of these claims? If the theist considered their god(s) to be a non-participant in the world and any hypothetical afterlife, then it would not matter whether the god(s) existed or not. The debate simply wouldn't exist. A debate only exists because theists claim knowledge about their god(s)' interaction with the world and/or actions in the afterlife; and thereafter knowledge of what must be done to ensure people gain the favour of the god(s) for this. This leads us to the Atheist's Wager, which proves that regardless of the existence or non-existence of any god(s), the best outcome in both the temporal and spiritual domains is to live your life as if no god exists, and live a good life as defined by humanist philosophy. Not only that, but it also provides the best outcome for other people, and hence is the best moral position. This is proven by simple logic, without the need for evidence of the truth of either case. Having proven that humanist philosophy is the highest moral standard and the best outcome in all cases, it's then necessary to question why we should care whether the god (s) exist or not. This is the crux of where the theist's case falls down. When the existence or non-existence of god (s) is seen as a key question for how to live your life, of course it's important. But take that away, and the theist's whole argument is no more relevant than a 5-year-old trying to get their parent to answer whether they think a ninja could beat a dinosaur. Of course having an opinion on the subject is based on faith. But being willing to argue on the subject is based on either being irrational or having too much free time. As such, the fact the theist even cares about it invalidates their argument. As you can see faith is a thing that can change on the spot. But many people define faith as something fundamental and unchangeable, that cannot be impacted by such trivial action as observing the world outside. Thus a 'loaded term' complicates the discussion. Let's resolve it by naming the latter thing an axiom (unchangeable) and the former a belief (very much changeable). If you assume axioms, you can base proofs of them. These proofs expand your knowledge about the world created by the axioms. The proofs don't depend on observations of the world, but on observations of the axioms. This is your current worldview, as your question mentioned words 'proof' and 'proving' about six times. On the other hand, beliefs don't enable proofs. This is scary. One day you believe electrons are small chunks of matter, tomorrow some irritating publication appears about how an electron was observed to interfere with itself and you have no authority to banish these outrageous observations. Then they build a bunch of stupid transistors and they somehow work and beautify our lives, although nobody proven that beforehand. If someone says a belief is true or proven, they probably mean it has been used to predict a lot of outcomes and mostly suceeded. They don't probably mean that the belief is infalsifiable in principle or that it is induced from infalsifiable axioms. Theism is overwhelmingly based on axioms. No major religion says "If this book doesn't work too well in practice and you see other theories working better - then by all means use them! Absolved! Amen!". It's very simple. Theism is belief in deity. Atheism is lack of belief in deity. Neither position comments upon the ontological status of deity. Atheists and theists, however, may hold any variety of opinions or beliefs. 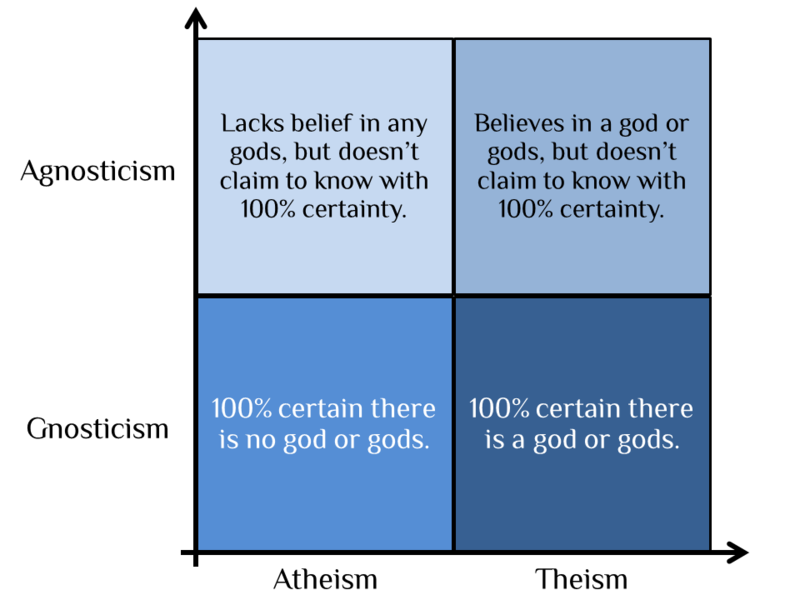 While I think atheism fits into the categories of being a worldview and even a religion (though it stands apart from the others in that category, just as anarchism can be considered political even though many anarchists oppose any form of political system), this doesn't necessarily mean that it is faith based. The essence of faith is a confidence or ability to trust in the present and future because of past reliability. I trust in my chair to not collapse because it's held me up thousands of times before. I have faith in my spouse and family to support me because they've been there for me in difficult times before. I don't have faith in my government to make good decisions for the betterment of my nation because they've shown themselves to be lily-livered and self serving. It's easy to see how theistic religions are faith based. Many have scriptures which tell a history of their god or gods being trustworthy. Many teach an ethical system which they believe is shown repeatedly to lead to human flourishing. Many encourage their people to share with their communities how their god or gods have supported them through difficult times. Religious people have faith when their past experience of the divine leads them to trust the divine for the future. I'm having a hard time thinking of how atheism could be faith based in this way. While many atheists may trust in their own self-fortitude in difficult times, this is not the same as trusting in their atheism, and of course many theists also trust in their self-fortitude. Many atheists may have confidence that their moral system will continue to lead to good outcomes but again that's not the same as trusting their atheistic beliefs. So although most atheists may still be people of faith (in the sense that we all trust many things), they don't have faith in their atheism itself. Not being a philosopher, I prefer the viewpoint based on the scientific method (Karl Popper, I believe? ): you can never prove the truth of a theory by experiments - but a single experiment can disprove a theory. Based on this principle, I'd say that Atheism is a stronger theory than Theism (and I do know I am committing violence on the idea of faith): a scientific theory makes testable predictions - a Theistic theory would presumably state something like '...God is/does/will do ....', and you can then test your prediction; to my knowledge, there has never been a positive, unambiguous, reproduceble result, so IOW, Theism fails in its predictions. Atheism states the opposite: There is no God, and there has never been any exeriment that has produced a contradiction. This is admittedly not proof that Atheism is right - it is simply not scientific to claim absolute truth - but I'd say Atheism stands stronger than Theism. I'm not sure what is being asserted here, that 'burden of proof' is always just an expression of bias, or only when talking about God? It is often used in informal logic, and is easily understood. If someone says, “I saw a green alien from outer space,” you properly should ask for some proof. If the person responds with no more than something like, “Prove I didn’t,” then they are not accepting their burden of proof and are improperly trying to place it on your shoulders. I suppose most people would grant you that God is significantly different from green aliens or pixies. But isn't that only because we can go some way to proving the positive claim that God exists, and not pixies? Whether or not the theist can actually shift the burden of proof onto the atheist. There's a few pieces to this. The first is that the burden of proof is just a structure for debate purposes. It can mean several things. For instance, in virtually all cases, the burden of proof is on the person making an assertion. In this light, claims of theism and atheism are going to be on par. However, there's a bias to deal with here, which comes to light if we don't have an agreement on which side is making an assertion. If I put the strictest theist and the strictest atheist in a cage together, and started taking bets, I would not easily be able to argue who is the one making the claim. However, there is a situation where we do actually legitimately need the burden of proof. There are many cases where the negative cannot be proven. Many questions in the negative form refuse proof. This is the basis of Russel's Teapot in orbit around Jupiter. Proving its non-existence is truly beyond our resources. One would need to meticulously study the space around Jupiter for a long time to prove it isn't there. However, should someone want to prove it is there, they merely need to provide us its ephemeris, and we can go search for it. This does not mean burden of proof is always on the positive statement. I can say "There are no integers between 5 and 8, inclusive, which has an integer square root." I just made a negative statement, but very importantly I made a statement on a domain which could be exhaustively searched. We can check 5, 6, 7, and 8 and conclude none of them have an integer square root. Contrast this with the famous "The real part of every non-trivial zero of the Riemann zeta function is 1/2." In this case, the domain is the entire real number line, and nobody has found a way to exhaustively search it. If someone asserted there existed a zero with a real part that wasn't 1/2, it would be easy for everyone to check it. Asserting that no such number exists is hard. But it's not impossible. The trick is that the rule "the burden of proof is to prove existence" can be sidestepped, and many theists do. The first thing to do is get you to agree that something exists. "The universe" is typically a good one to start from. From there one can look at what must be true because the universe exists, and try to argue that its existence implies that an entity in a class like God must exist. And therein lies what I think is the most common back and forth of the theist/atheist argument. There's a difference between "God exists" and "There exists an entity with these properties, and we will call it God." In the former, the burden of proof quite clearly must fall on the theist, but in the latter its a much more nuanced question. All of the good debates on the topic I have seen have quickly shifted to the latter argument and stayed there. In my view, atheists also suffer from the same problem of providing a proof of their position. Specifically that they cannot prove that God is non-existent. Yes. If you apply this consistently, you will conclude that every conclusion is faith based. So you will either have to accept that all knowledge is faith based or use special pleading to single out atheism. Let's try doing this same thing with any claim other than the claim that an undetectable God exists everywhere, say the claim that undetectable cats exist everywhere. Suppose someone searches a small room for cats and doesn't find any. They conclude that there are no cats in that small room. Is this conclusion faith based? Stop and think about this for a moment. If this conclusion is faith based, what conclusion isn't? But to conclude that there are no cats in a small room just because a search doesn't find any, we must definitively reject the claim that there are undetectable cats everywhere. But how can we prove that there aren't undetectable cats everywhere? We can't. So either all positions are faith based because we cannot take that position without disproving all of the infinite number of imaginable ways we could be wrong or you will have to use special pleading to single out atheism for this treatment. If we can't reject the claim that there is an undetectable god everywhere without faith, we can't reject the claim that there are undetectable cats everywhere without faith. Thus, my belief that there isn't a cat under my desk and your belief that there isn't a cat on your head is faith based. Can that possibly be right? I hope you don't think so. If you want to argue that all knowledge is faith based, that's fine. But be honest about it and don't pretend that this is something special about atheism or issues involving theism. From the point of view of cognitive science, you are right. Being convinced/believing that something is true and intellectually knowing/having proof that something is true are two cognitively/neurologically distinct states. So believing in the statement "there is a god" is not different from believing the statement "there is no god", neurologically the two beliefs share the same mechanisms. So if your position is that faith is defined by the cognitive state of having a belief in something/being convinced that something is true, then your conclusion is correct. However, as you can see in the other answers, you can choose a different definition, and then the conclusion is not necessarily correct. You can also start from the assumption that having a proof for something and believing in it are the same (which is common in folk understanding of the mind's workings), which will also lead to a different conclusion. While this assumption is empirically known to be incorrect, most people with whom you discuss this question will implicitly use it, so they will not readily follow arguments which violate it, and may be completely dismissive if you start with explicitly stating/trying to prove to them that it is untrue (yes, I realize that's ironic). Some literature you might want to consider would be On being certain by Robert Burton (cognitive science, popular-science level), The Neural Basis of Human Belief Systems (cognitive science, highly specialized literature, make sure you can follow it before spending money on it) and most of Damasio's work, if you want something from the philosophical side. I guess Descartes' error might be the most relevant one. In my experience theists tend to be people who just 'know in their hearts' that some god exists. For them, evidence is either unnecessary or not even conceptually recognised. This default position is challenged when an agnostic or atheist demands that person 'prove' themselves or supply the required evidence, something they don't understand. However, the debate is avoiding the real issue. The theist in that position is almost always incapable of describing what that deity actually is. There is almost always just an abstract notion of morality manifested as some invisible overarching power. This concept ultimately matches many atheist positions of our lives being to some extent deterministic or at least emergent as part of larger patterns. Alas for I found no answers worthy to upvote; so I will answer. Nobody is disputing that "God exists" is faith based. That's a good place to start. It occurs to me the measure of faith required to be atheist is about the same as the measure of the difficulty of proof that "God is irrelevant' would be. Theorem: either the universe is infinite in a way that allows all possibilities to occur or our own existence must pass through the odds or something enough like God exists to bypass the odds. There are certain mathematical problems with the infinite mass universe, and the infinite time universe is ruled out, so now it comes down to measuring the odds. First problem: the laws of physics are fine-tuned to allow life to exist. We can't measure that so in fairness, let us just set it at 1. Second problem: We must have a planet suitable for sustaining our own life. It was once thought that almost any planet would do, but this is selection bias of the worst kind. In fact I have a long table that tries to put odds at each of more than fifty independent criteria that all must be true, and is loose enough to allow a moon orbiting a gas giant in the life zone to work (but moving Jupiter would not). The combined result is 1 in 10^99 but you get to try once for every star in the universe. Third: life must become naturally. Whether this is easy or hard depends on evidence selection. We can't do it in the lab, but early Earth history says it appeared more than once, but there are not two completely independent genetic codes but only one and variants. We may note that we can widen the life becomes gate a bit if we're willing to tighten the planetary requirements, but this adds a square to the planetary requirements as we now require two suitable planets so it's not worth it. Forth: life must be come intelligent. Odds calculation is too hard. I have never encountered anybody who thinks he really knows all the evidence to these (though many who tried to argue them all while possessing real knowledge of none and clearly did not investigate to any significant degree), but holding but one of these without having actually investigated the evidence results in having a faith-based position. If you want a way out, it's certainly possible for someone to fool himself into thinking he has diligently considered them all while having actually not done so, but that doesn't change the nature of the position. Not the answer you're looking for? Browse other questions tagged theology atheism or ask your own question. Is there a demarcation problem for religions? Why should atheists bother debating theists?